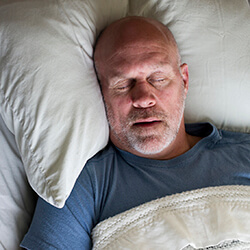 If you frequently wake up sleepier than you were before you went to bed, if you’re a chronic snorer, or if you just can’t seem to get a full night’s sleep without waking up over and over again, you may be suffering from obstructive sleep apnea. Dr. George Michaels treats the condition using the TAP 3 removable oral appliance. Sleep apnea affects millions of adults in the US, and it can cause real harm when left untreated. Your body needs enough deep sleep each night to recharge. Without it, your organs are constantly under stress — and that sustained state of activity can be especially harmful for your heart. 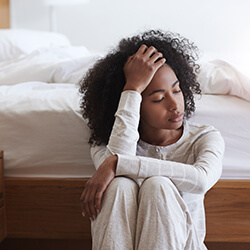 People who suffer from sleep apnea are also at a higher risk of heart attack, high blood pressure, and stroke, among other serious health conditions. The most common form of sleep apnea, obstructive sleep apnea, is caused when the soft oral tissues constrict and block the proper flow of air during sleep. Without the oxygen it needs to survive, the brain sends out an emergency signal to wake up. Sleep apnea sufferers jerk awake hundreds of times per night. Your dentist in midtown Atlanta offers snoring and sleep apnea therapy with the TAP 3, a removable oral appliance that repositions the lower jaw to keep the airway clear throughout the night, reducing snoring and improving breathing. 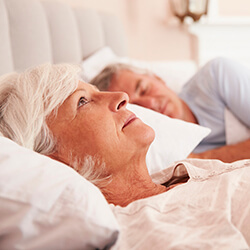 Unlike other methods for sleep apnea treatment, the TAP 3 is comfortable and easy to use, helping patients regain their restful sleep at long last. Have you recently received a sleep apnea diagnosis? Request an appointment to begin treatment and get the relief you deserve.